It’s late on a Friday night when Casey’s mobile starts to ring. The Jonathan Ross show has just started and Casey’s expecting it to be her daughter Riley - to alert her that one of her favourite actors is on. But it isn’t Riley. It’s a woman from the Emergency Duty Team. So begins Casey and Mike’s latest fostering challenge, in the shape of fifteen year old Keeley, who’s run away from her long term foster home 25 miles away. 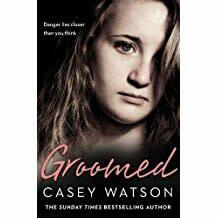 Keeley is polite, but she’s sharp, and Casey immediately sees all the hallmarks of a child who’s been a long time in the system - and one who also knows how to play it. Keeley’s left her foster family having accused her foster father of sexually abusing her, a claim both mum and dad vehemently deny. But such an allegation can never be taken lightly, so while the claim is investigated more fully by social services, a new home for Keeley must be found. Whether the allegation is true or otherwise, Casey and Mike both know that there will be no ‘winners’ here. If it’s true, then a young girl’s life has been torn asunder, and if it’s not, then the heartache for the family will be matched by the knowledge that Keeley’s own outlook will now be bleak. In the short term, however, it’s a case of containment; giving Keeley their support and a safe place to stay. But with the whole dangerous world of the internet at her disposal, it seems this strong-minded youngster has her own ideas about where that safe place should be….